It is difficult to overstate how dominating Lefty Grove was during the 1930s. Along with winning two World Series titles, he also completed pitching's Triple Crown in 1930 and 1931. 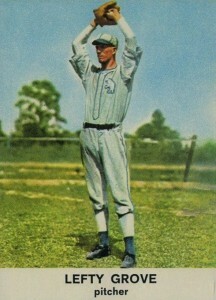 Grove's performance on the mound translated into great demand for his trading cards and he was frequently include in baseball card sets. This top list examines his baseball card portfolio and highlights the key Robert "Lefty" Grove cards from his playing days and more contemporary releases. Shop for Professionally Graded Lefty Grove Cards on eBay. It only took Grove 17 seasons with the Philadelphia Athletics and Boston Red Sox to amass 300 career wins. Perhaps more impressively, he had the league's lowest ERA nine times over his career, which is still a record. 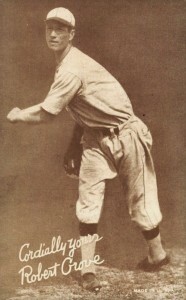 He is also one of the few pitchers to have been named the league MVP (1931). Lefty Grove's career was also filled with unusual and remarkable occurrences. He became the first pitcher to have two immaculate innings, which involves striking out the side on nine consecutive strikes. Although he was a marvel on the mound, he was a nightmare at the plate and became the first MLB player to strikeout five times in a nine-inning game. Outside of the list below, there are several other notable Grove cards. If you are a collector having difficulty tracking down an authentic autograph or maybe your budget makes it unlikely, take a look at 2003 Upper Deck SP Legendary Cuts and their Historical Impressions inserts that have rubber-stamp facsimile autographs built directly into the cards. You might be surprised to find that Lefty Grove has a 3-D card as he was featured in the 1972 Kellogg's All-Time Baseball Greats set. Another interesting and unexpected Grove card can be pulled out of 2014 Panini National Treasures. It is a combo relic card featuring Grove alongside a fellow pitcher with a similar nickname, Lefty Gomez. The two are regularly confused for one another. 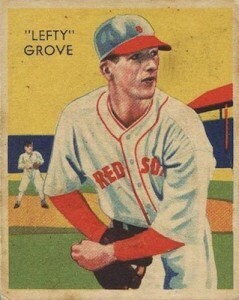 Lefty Grove's early trading card appearances include some of the most popular and limited sets ever produced. In making this list, overall availability was paired with card value and importance in building a comprehensive collection. 1976 Topps included several cards devoted to the players that The Sporting News determined to be the all-time greats at their given position. Some players included were Lou Gehrig, as the first baseman, and Walter Johnson, as the right-handed pitcher. 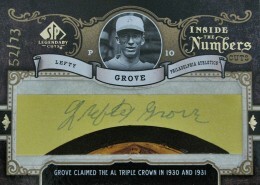 Grove was selected as the greatest left-handed pitcher (LHP) and his card rounds out the subset. The 1961 Golden Press set was small at only 33 cards and featured Hall of Fame players in colorized photographs. Grove was elected to the Hall of Fame in 1947 and has the highest winning percentage of pitchers with over 300 wins at .680. 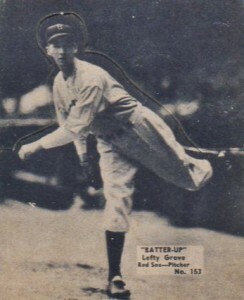 These tall photograph cards put out by Exhibit are termed "salutation" cards because each card in the set has a printed salutation, such as "cordially yours" on Lefty's card, printed above the player's signature. Collectors can also find series of similar cards with just the signature and no salutation. The 1932 U.S. Caramel set, which includes non-baseball players as well, was issued by a candy maker who wanted kids to collect the entire set and turn it in for a baseball and glove. When that was done, the cards were punched or stamped as "redeemed" and so undamaged versions hold a much higher premium. 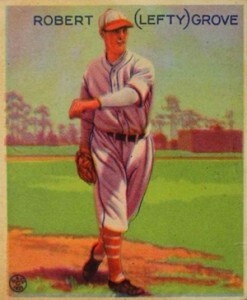 The 1934-1936 Batter-Up card could rank higher on the list were there simply more examples available to collectors. 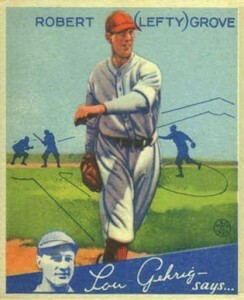 The card's high value demonstrates the strong interest in this one-off set made by National Chicle and Grove's relatively high card number means it was probably issued in 1936, near the end of the print run. Lefty Grove passed away in 1975, meaning his collection of certified autographs is limited almost exclusively to cut signatures. For collectors interested in that option, take a look at the 2007 Upper Deck SP Legendary Cuts set which has quite a few options available. After investigating the quantity of his autographs in the marketplace, it seems that cut autographs and in-person or through-the-mail autographs greatly outnumber the amount of jersey relic cards that have been issued by the major card companies. This is certainly a rarity in the hobby. The 1941 Double Play set, which places two teammates together on a small card, can occasionally strike gold by having two future Hall of Fame members on the same card. 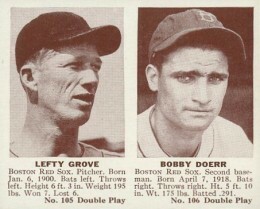 This was the case with the Grove card that is shared with Bobby Doerr, the great Red Sox second baseman. Occasionally, separated versions of the Double Play cards will come up for auction and those hold only a fraction of the value of the still-intact versions. 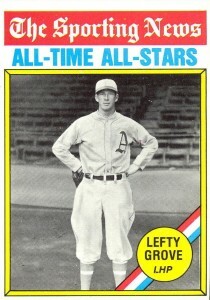 Grove's 1934 Goudey card bares a strong resemblance to his 1933 Goudey card but with a few new additions. Lefty's hat has been painted red to denote that he was now a member of the Boston Red Sox after being traded at the completion of the 1933 season. The blue players in the background along with the famous "Lou Gehrig says..." banner also differentiate it from the earlier set. The 1934-1936 Diamond Stars set is a personal favorite of mine and Grove leads off the set. Produced by National Chicle, the same company that issued the Batter-Up set, the cards were released over several years and you can typically determine the year the card was issued by the statistics on the back. 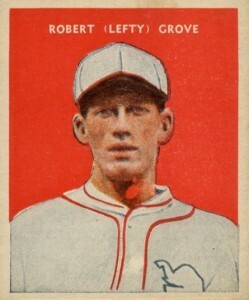 There is a 1934 and 1935 version of Grove's card, both with a green back. The key card in the Lefty Grove baseball card collection would have to be his appearance in the 1933 Goudey set, which is arguably the most popular pre-World War II set. Even with near-mint grading, this card can eclipse $500 at auction. Cards with a better grading condition are rarely found but go for substantially more. 1934 - 1936 Batter Up #153 Lefty Grove Boston High Number Tough!